If your first reaction was 'I've already done that', then please do so again. You may have seen Jemima's post about the failure of the newsletter software in April. This has now been sorted out (it takes a while when she's written three books and edited another since the end of March). The problem appears to have occurred before the backup she re-installed, which meant we lost the original list of subscribers completely. 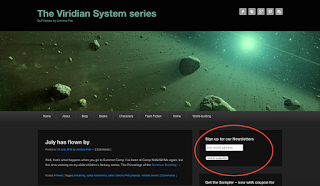 We apologise for the inconvenience, but please sign up again at the Viridian Series website, and get ready to receive occasional offers, exclusive news and insights into Pete and the Swede, Dolores, Maggie and Zito as they explore the outer reaches of the galaxy. And inner bits, too. We promise we will not use your email address for any other purposes than sending news of the series. Your data will not be shared with any third party, other than the app MailPoet, who host the sign-up admin (subscribe/unsubscribe forms and algorithms), and they do not keep any copies of your details. At present we plan to re-release The Perihelix in the autumn, with special arrangements for those already in possession of the first editions. I've now switched newsletter editors to MailChimp, which I hope will work better. Those who have resubscribed already have been manually added to this list.